If you’re looking for lake homes for sale in Tennessee, set your sights on Cherokee Lake. Cherokee Lake attracts more than two million lake goers and recreation enthusiasts each year with its winding shorelines, sprawling landscapes, and premium fishing. Once frequented by historic icons like Daniel Boone, the lake region has strong ties to the state’s history and future. Explore the natural beauty of Cherokee Lake as you indulge in all the outdoor fun and adventures to be had year-round. Cherokee Lake borders Grainger, Hawkins, Jefferson, and Hamblin Counties. With inlets that twist and turn in intricate patterns and recesses, the lake stretches an impressive 463 miles. Such a meandering shore and lengthy pool makes Cherokee Lake the ideal destination for die-hard anglers. Lake conditions are continually monitored to ensure anglers are treated to great fishing all year long. Fish habitats are maintained with the growth of willow, river birch, and bald cypress trees. Striped bass fishing is especially fruitful in these waters, but you’ll also find healthy numbers of crappie; walleye; sunfish; sauger; catfish; and white, largemouth, and smallmouth bass. Boasting 28,780 acres of water surface, Cherokee Lake is prepared to host all your recreation activities. A picnic area, boat launch, and swimming beach are situated near the Cherokee Dam, which itself is 6,760 feet long. Similarly, a number of public parks, boat docks, marinas, and camping facilities surround the lake for your enjoyment and convenience. Lakefront properties look out on open waters dotted by sail boats, jet skis, rafts, canoes, and swimmers. Treat the trail blazer within by exploring the many small islands and coves you’ll find around the lake, and don’t hesitate to claim your own shady spot on the beach—there’s plenty of room for everyone! Panther Creek State Park offers more than 1,400 acres of land to explore, as well. Trails for biking, hiking, and horseback riding take you deep into the forest, where you might even cross paths with a white-tailed deer or an owl. You'll also find excellent golf venues near the lake. Cherokee Lake is surrounded by several notable public clubs, like Patriot Hills, Millstone, and Dandridge Country Club. If you’re interested in living on a Cherokee Lake golf course, visit GolfHomes.com for property listings and details. Cherokee Lake properties for sale are privileged to many local attractions. Head to Pigeon Forge for a full day of fine dining, shopping, and entertainment at The Parkway. The entire family will be impressed and amazed by WonderWorks, an educational attraction that literally turns reality upside down. Cherokee Lake covers 30,300 acres at full pool, is 59 miles long, and has 463 miles of shoreline attracting over 2.5 million visitors annually. It collects water from a 3,428 square mile watershed. Cherokee Lake is shared by Hawkins, Grainger, Hamblen and Jefferson Counties. The three major towns surrounding Cherokee Lake are Morristown, Jefferson City, and Rogersville. The water level in the reservoir varies about 40 feet in a normal year. Cherokee Reservoir attracts millions of recreational visitors each year. Along its shorelines are public access areas, county and municipal parks, commercial boat docks and resorts, a state park, and a state wildlife management area. There are many tent and trailer sites for campers. 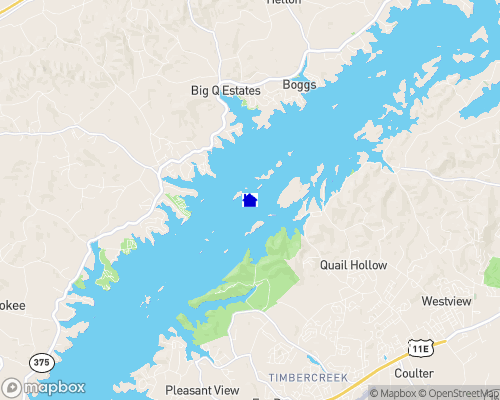 Fish densities in Cherokee Lake are greater than most of the other TVA Reservoirs due to the high level which results in a dense forage base of Threadfin Shad, Gizzard Shad, and Alewife. A variety of fish attractors have been constructed over the years in an attempt to improve fishing for anglers. These include brush piles which are used by many game fish, and stake beds which are used primarily for concentrated crappie. The TVA has also planted Willow, Swamp Oak, Bald Cypress and River Birch in drawdown areas to create additional long lasting habitats. Cherokee Lake is known for its Striped Bass fishing, but also offers Black Bass, Crappie, Walleye, Sauger, Sunfish, White Bass and Catfish. Large Mouth and Small Mouth Bass are not stocked in Cherokee Lake because of their great abundancy. Of all the TVA lakes tested, Cherokee Lake has the highest score for large mouth bass. Cherokee Park Located on Cherokee Lake three miles north on U.S. 25-E. They have 60 camp sites, tables, grills, electric hook-ups, city water, dump station, flush toilets, hot showers, boat dock, fishing, picnic tables and a playground. The TVA provides a variety of recreational faculties at Cherokee Dam including a day use area with a swimming beach, picnic area and a year round boat launch ramp. The campground is open from April to September. There are no hookups for RV's but hot showers are available. For more information on recreational opportunities call 1-800-TVA-LAND.